Comments: The James River Division of the Chesapeake and Ohio (previously property of the Richmond and Allegheny Railroad Company), was of great importance to Scottsville as it hauled freight, passengers, and the daily mail to town. As did the James River and Kanawha Canal before it, the C & O train connected Scottsville to the commercial centers of Richmond and Lynchburg. A purely Scottsville amusement in the early 1900's was watching the train go by. As shown here, it was common to see a good-sized group of townsfolk strolling down to the depot with Postmaster Gault to meet the Number 11 from Richmond and pick up the day's mail. (13) Walter White; (14) Jim Poe. The station is located on land that was originally owned by the James River and Kanawha Canal Company from the late 1830's to 1880 when the company and its property were bought by the Richmond and Allegheny Railroad Company. In 1881, the canal bed was drained and railroad tracks laid on the towpath. In 1890, the Richmond and Allegheny and its property were bought by the Chesapeake and Ohio Railway Company (C & O). This wood frame depot stood on this site until the present brick station was built in 1915. The wood frame depot was erected by C & O to service passenger traffic on its railroad in the early 1890's; an older wood structure on the other side of the track was used as a freight station. In 1913, the C & O planned to remodel the station to make it a more permanent structure (a brick design) plus to add an express/baggage. Why did they feel it necessary to enlarge the passenger depot? A review of the passenger business at Scottsville determined that both the number of passengers and the passenger revenue doubled in the 1891-1916 time frame (3231 passengers and $3396.46 revenue in 1891 with 7420 passengers and $7210.67 revenue in 1916). It appears that C& O needed the larger passenger station to manage the increased passenger traffic. The brick passenger depot built in Scottsville by C&O ca. 1915. As people began driving their own cars and, later, traveling by busses and airplanes, Scottsville's use of the railroad as a mode of personal transportation dwindled. The last C & O passenger train from Richmond to Clifton Forge stopped in Scottsville in October 1957, and the station was closed in August 1977. The building was then used several times weekly by freight and maintenance staff and for equipment storage. A mobile agent, however, served the area's freight needs. In 2016, the Scottsville Depot is owned by CSX Corporation and in quite a dilapidated condition. 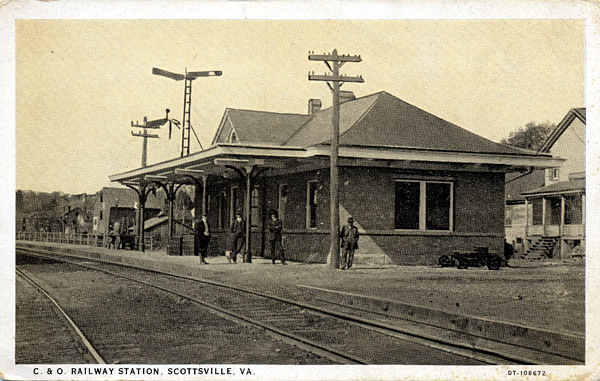 In 1915, Scottsville was served by two trains east and two west each day. One set of these were a through train between Richmond and Clifton Forge, while the other ran between Richmond and Lynchburg, the latter apparently mainly for Lynchburg-Richmond business since it ran at times inconvenient to Scottsville and other intermediate Rivanna Subdivision stations. In addition to coaches, Nos. 9 and 10 had a buffet parlor car for first-class passengers. Interestingly, No. 11 carried a 12-section/1-drawing room Pullman car between Richmond and Lynchburg that must have been used as a parlor car. No. 12 carried this car back to Richmond for sleeping service. This Pullman car could be occupied at Lynchburg at 9:30 pm and left at 2:30 am for arrival at Richmond at 8:35 am. This may have been one of the shortest Pullman runs on the C & O ever. Therefore, Scottsville even had first-class passenger service available in addition to the usual coach service, at least for a period. Passenger service continued to decline on the James River Line starting in the early 1920's, and in 1930 new Brill Gas-Electric motor trains took over the work. By 1950, a single motor train each way from Richmond to Clifton Forge was handling the remaining local business on the line. It left Richmond as No. 9 at 7:10 am, arrived in Scottsville at 9:51 am, and terminated at Clifton Forge at 3:50 pm. No. 10 left Clifton Forge at 8:35 am, Scottsville at 2:05 pm, and arrived in Richmond at 5:05 pm. This passenger service lasted until October 1957, when it was discontinued, ending all passenger service on the line. Reference: "A Depot for Scottsville" by Thomas W. Dixon, Jr., C & O Historical Magazine, Fall 2014; p. 28-33.